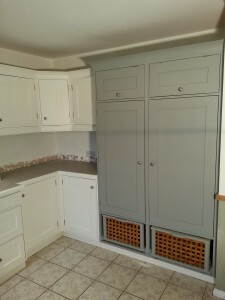 This was quite an interesting refurbishment prodject i recently carried out for Traditional Painter.com, in Melchbourne, Bedfordshire, 18 years old was supplied and fitted by A Bell & Co Ltd of Northampton. 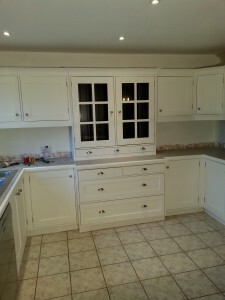 In need of a major make over, 1st job was to carry out repairs to the doors, 4 of them had joints that had become loose and cracked, i drilled and screwed and glued the loose joints, they where then clamped over night to dry. 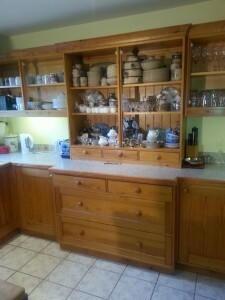 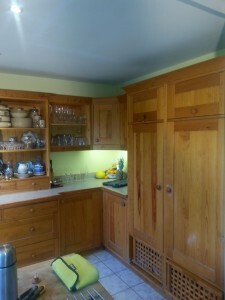 Next job was to completely steam clean the complete kitchen furniture to degrease after removing the doors and drawer fronts. 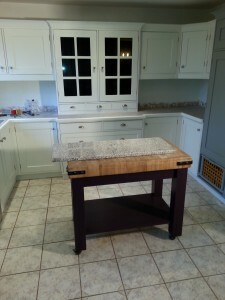 2 pack filler was then used to fill the old holes from the handles and make good where required, two coats of quick drying undercoat was then followed by two coats of Furniture paint in a semi matt finish colour match equivalents to Farrow & Ball Pointing, Manor House Grey & Pelt on the butchers block. 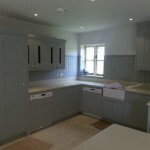 The colours worked very well together as you can see from the finished photos, I also supplied and fitted new handles supplied by Parker Kitchens of Northants. 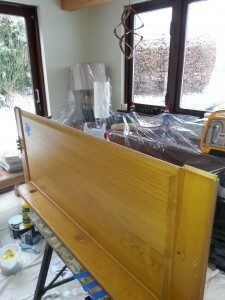 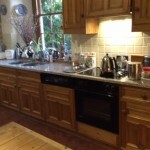 Paul has wonderfully transformed our very tired Bells kitchen which was almost 20 years old. 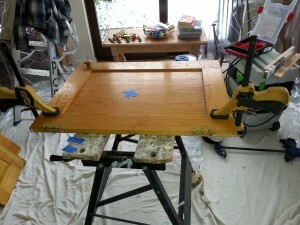 His preparation and painting of the doors is superb and the finished results are outstanding. 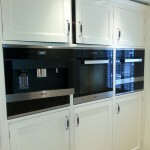 Choosing the door colours was the hardest job we had to do and with the new handles it truly is a new kitchen. 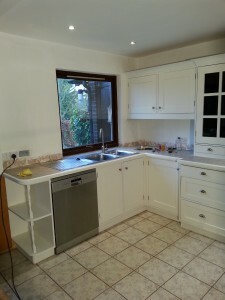 We also had coloured glass splashbacks and LED lighting installed which completed the transformation.